fvogt added a comment to D20659: Copy container in Component::cleanUp before interating. fvogt committed R268:78a711361db3: Copy container in Component::cleanUp before interating (authored by fvogt). fvogt closed D20659: Copy container in Component::cleanUp before interating. fvogt retitled D20659: Copy container in Component::cleanUp before interating from Detach container in Component::cleanUp before interating to Copy container in Component::cleanUp before interating. fvogt updated the test plan for D20659: Copy container in Component::cleanUp before interating. fvogt updated the diff for D20659: Copy container in Component::cleanUp before interating. fvogt requested review of D20659: Copy container in Component::cleanUp before interating. fvogt accepted D20582: Only consider player gone if really no longer part of the visible DOM. fvogt accepted D20596: Set Breeze scrollbars only on HTML tag. No idea about CSS - as this commit is about breaking the style for most cases though it's probably fine. fvogt accepted D20593: Minimize code duplication between node and its children. fvogt added a comment to D20582: Only consider player gone if really no longer part of the visible DOM. fvogt accepted D19857: [DownloadJob] Report total size only if known. fvogt accepted D20096: Fill UDSEntry::UDS_CREATION_TIME under linux when glibc >= 2.28. Code still looks good to me - I can't comment on the cmake parts though. fvogt added a comment to D20407: [Folder View] Improve label crispness. Probably a side effect of the label width change(s). fvogt added inline comments to D20227: Remove player from known players list when it disappears. fvogt added a comment to D20096: Fill UDSEntry::UDS_CREATION_TIME under linux when glibc >= 2.28. Looking good to me, @bruns: any addiitonal comments? fvogt requested changes to D20096: Fill UDSEntry::UDS_CREATION_TIME under linux when glibc >= 2.28.
fvogt committed R98:9aa944ead1a8: Merge branch 'Plasma/5.15' (authored by fvogt). fvogt added a comment to D17187: Set the default cursor theme to breeze_cursors. I just noticed that this change is missing again in 5.15.
fvogt committed R98:b00e12ff3926: Set the default cursor theme to breeze_cursors (authored by fvogt). fvogt requested changes to D20259: Fix compilation with LibreSSL. So libressl's API is mostly openssl < 1.1 with some 1.1 functions sprinkled in? That's annoying. It might be easier to adjust the check for OSSL_110 to not set it with libressl. fvogt added a comment to D20259: Fix compilation with LibreSSL. Can you reupload this diff with context? fvogt accepted D20201: Fix build with Qt 4.
fvogt requested changes to D20201: Fix build with Qt 4.
fvogt requested changes to D19857: [DownloadJob] Report total size only if known. Additionally, the bytesReceived > totalAmount case is currently not handled at all, but I'm not sure whether that's something for KJob or here. fvogt added a comment to D20135: Enable the k3b helper by default. fvogt added a comment to D20166: Keep desktoptheme SVG files uncompressed in repo, install svgz. I'm very much in favor of this, but don't know anything about the cmake magic involved, so can't really say much about that. So unless I am mistaken, I feel this is not a great concern. I would perhaps need to restrict when statx is used even when STATX_BASIC_STATS is defined to when GLIBC is defined as well. And thinking again about the issue, could we have kio compiled with glibc but running on a system with musl for instance ? If it is possible, then I need to treat this case as you suggested to handle the runtime dependency on glibc. Note that, even if the system supports statx() (so with glibc >= 2.28), you must support systems without it at runtime anyway: for example, if you boot with a kernel older than 4.11 (which IIRC is the version where the syscall was added) then the glibc function will return ENOSYS (IIRC, better check). This can happen for example in containers: you boot a Debian testing container (so with glibc 2.28) on a Debian stable system (with Linux 4.9). In case the syscall does not exist, glibc provides a generic implementation based on stat. There are platforms out there which don't use glibc. So I suggest either handling ENOSYS properly by falling back to stat or erroring out if statx is supported but GLIBC not defined. If the platform does not use glibc, STATX_BASIC_STATS will be false and statx won't be called, the other existing code path will be used. STATX_BASIC_STATS implies GLIBC and statx availability at least until other C standard libraries support it. fvogt added a comment to T10263: FUSE daemon for accessing KIO Slaves. @feverfew Sure! I don't know much about GSoC though, I hope that's not an issue. @fvogt Great, I can tell you more about it on a platform of your choice. What's your preferred method of contact (.e.g email) so we can get a project submitted (deadline is 9th April)? fvogt added a comment to D19821: Fix breeze dialog background with Qt 5.12.2.
fvogt committed R242:3aba8a7e10e5: Fix breeze dialog background with Qt 5.12.2 (authored by fvogt). fvogt closed D19821: Fix breeze dialog background with Qt 5.12.2.
fvogt updated the diff for D19821: Fix breeze dialog background with Qt 5.12.2.
fvogt updated the summary of D19821: Fix breeze dialog background with Qt 5.12.2.
fvogt requested review of D19821: Fix breeze dialog background with Qt 5.12.2.
fvogt added a comment to D18845: authority: add support for passing details to polkit. LGTM to me as well - I'm not familiar with this code at all though. fvogt accepted D19707: Make QQC2 desktop style a RUNTIME dependency. fvogt added inline comments to D19707: Make QQC2 desktop style a RUNTIME dependency. fvogt committed R242:02ec1b77c23e: Show a warning if a plugin requires a newer version (authored by fvogt). fvogt closed D19394: Show a warning if a plugin requires a newer version. fvogt requested review of D19394: Show a warning if a plugin requires a newer version. fvogt committed R120:4b0d05857842: Merge branch 'Plasma/5.15' (authored by fvogt). fvogt committed R120:356a1fa9d808: Merge branch 'Plasma/5.12' into Plasma/5.15 (authored by fvogt). fvogt committed R120:7816978b5120: Don't show entries with NoDisplay=true with the applauncher containmentaction (authored by fvogt). fvogt committed R120:8192bd3aec27: Don't show entries with NoDisplay=true with the applauncher containmentaction (authored by fvogt). fvogt closed D19157: Don't show entries with NoDisplay=true with the applauncher containmentaction. fvogt requested review of D19157: Don't show entries with NoDisplay=true with the applauncher containmentaction. fvogt added a comment to D18735: Improve built-in line/block characters drawing. Thanks for working on this - I think perhaps this should be committed to master after the 19.04 is branched next month. Objections? fvogt added a comment to D19027: Fix "Invalid URL: QUrl("some.txt")" warnings in Save dialog. Can you add context to this diff by either using arc or git diff with more context? fvogt resigned from D18735: Improve built-in line/block characters drawing. I can confirm that it fixes all border display issues that I encountered in the released version. fvogt added a comment to D18805: Workaround for the bug 393630 - SystemTray part. @ngraham Could you please help me to discard D18804 ? This patch does not require it anymore. fvogt added a reviewer for D18804: Workaround for the bug 393630 - Framework part: Plasma. fvogt requested changes to D18735: Improve built-in line/block characters drawing. fvogt committed R296:856672f370fb: Correct the accept flag of the event object on DragMove (authored by trmdi). fvogt closed D16643: Correct the accept flag of the event object on DragMove . fvogt accepted D16643: Correct the accept flag of the event object on DragMove . @trmdi: Do you have push access? If not, which name <mail> should be used for the commit? fvogt added a comment to D16643: Correct the accept flag of the event object on DragMove . fvogt accepted D18750: Bail out if stream is negative. The second change fvogt mentioned is IMHO handled quite strangely here - !m_enabled || m_temporaryInhibition is the inverse of !m_enabled || m_temporaryInhibition, so doing a event->ignore() === event->setAccepted(false) prior to the first return statement would cover the ignored case, and allows the event to bubble up. fvogt added a comment to D18662: Add and rename some YaST icons and symlinks. @fvogt LCP said a Qt bug was the reason that the icons weren't working correctly and that you would know more about it. I never got around to asking you though. Do you know which bug it is? I tried to understand what this change does both by trying to reproduce the issue and reading Qt code. Here the symptom was more drags not getting accepted at all than flipping back and forth, but this patch fixes that as well. fvogt committed R287:51d710adda14: Fix various OOB reads and writes in kimg_tga and kimg_xcf (authored by fvogt). fvogt closed D18574: Fix various OOB reads and writes in kimg_tga and kimg_xcf. fvogt updated the test plan for D18574: Fix various OOB reads and writes in kimg_tga and kimg_xcf. fvogt updated the diff for D18574: Fix various OOB reads and writes in kimg_tga and kimg_xcf. Also bail out early if image data known broken. fvogt requested review of D18574: Fix various OOB reads and writes in kimg_tga and kimg_xcf. fvogt added a comment to T10397: Qt 5.12 for plasma master. 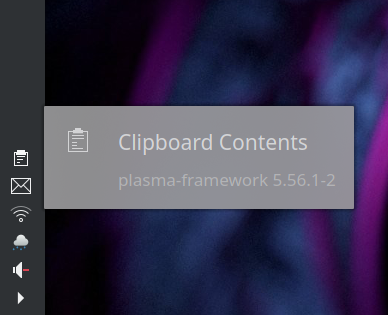 We've had Qt 5.12 packaged and available since the first alpha and started to build KDE software against the second alpha - would it be possible to do it similarly in the KDE CI? Starting to build also against pre-release Qt would be helpful as currently KDE CI is lagging behind what rolling release distros actually ship and it might help preventing some issues. fvogt accepted D18522: Name Wayland socket automatically when no socket name was specified. fvogt committed R127:d671fcd0c09d: Add option to use wl_display_add_socket_auto (authored by fvogt). fvogt closed D17122: Add option to use wl_display_add_socket_auto. fvogt updated the diff for D17122: Add option to use wl_display_add_socket_auto. fvogt added inline comments to D17122: Add option to use wl_display_add_socket_auto. fvogt accepted D10716: handle wrong password when using sudo which asks for another password. fvogt added a comment to D18366: Fix flickering with Qt 5.12. This should probably land on Plasma/5.12 as well. fvogt added a comment to D17122: Add option to use wl_display_add_socket_auto. fvogt updated the test plan for D17122: Add option to use wl_display_add_socket_auto. Use a new bool instead. Hmm, maybe then add another setter setAutomaticSocketNaming instead to switch to automatic socket name query instead. When it's not called before start it would fall back to old behavior. Yes, that's fine. Do you need it for something in 5.15? fvogt accepted D18353: Compile the virtual backend with older Mesa. I don't think we need a second variable effectiveSocketName. Just test if socketName is empty. If it is call wl_display_add_socket_auto, otherwise call wl_display_add_socket. If socketName is overwritten after using wl_display_add_socket_auto, it's not possible to call start twice without resetting socketName again. If the actual socket's name is not written to any variable, it's impossible to set WAYLAND_DISPLAY correctly in KWin. The new variable is used to be fully API compatible except if socketName was explicitly set to an empty string. Is a Display object meant to be started and terminated more than once? But ok, let's make sure. fvogt accepted D18309: don't set python exe to undefined. Tested with cmake 3.10.2, works. fvogt added inline comments to D18182: Fix new file creation leading to dupe items on a fresh view. fvogt added inline comments to D10716: handle wrong password when using sudo which asks for another password. fvogt requested changes to D10716: handle wrong password when using sudo which asks for another password. fvogt added a reverting change for R241:4e2a815b9a10: Refactor SlaveInterface::calcSpeed: R241:514ea33ead78: Revert "Refactor SlaveInterface::calcSpeed".